I meant to review a lot more comics during the time that Comics was on view at the Emergency Room, but I haven't been as diligent as I hoped. That exhibit is still on view through April 11. I hope you will find the time to go check it out. It includes original comics artwork from a variety of artists, including Otto Soglow and Walt Kelly, whose work I review below. The second part of the book involves an unintended trip to the island of Yap, where giant limestone discs were famously used as "money." Campbell explores the mythology and history surrounding this custom, and also discusses the economists who have used the example of Yap to discuss financial matters such as the concept of fiat money. But he finds himself more interested in the discs as artistic objects, carved by generations of anonymous Isamu Noguchis. At the end of the book, he suggests money problems have caused a serious rift between himself and his wife, suggesting that his frugal, conservative approach to money is no cure-all. For this book, he floats text above each panel. There is a lot of text, and as a consequence, the panels are quite small. It feels like the art is almost an afterthought. The book is in color, and Campbell makes full use of the digital toolbox, but in ways that feel unique to him. The work often involves photographs combined with drawn images and "painted" with slabs of Photoshop color. Sometimes this doesn't work, but overall, it's quite interesting. Because of their detail, photos have an effect of stopping the eye and interrupting the visual flow of a comics narrative. But Campbell's technique of digitally painting the photographic elements simplifies them in much the same way a well-crafted drawn cartoon panel is simplified. This keeps the eye moving and the narrative puttering along. Best of Enemies: A History of US and Middle East Relations, Part One: 1783-1953 by Jean-Pierre Filiu and David B (Self-Made Hero, 2012). Except for the first chapter, in which a Gilgamesh myth is retold using paraphrases from George Bush and Donald Rumsfeld, the content of this book is fairly straightforward. 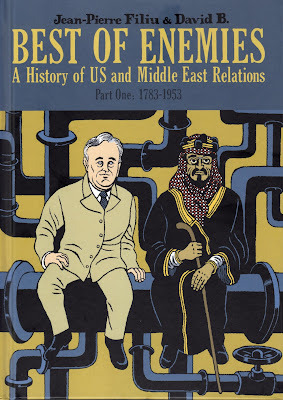 It is a brief retelling of U.S./Middle east relations, starting with our early wars with the Barbary pirate states, our inability to prevent France and Britain from carving up the Ottoman empire after World War I, our establishment of friendly relations with the Saudis during World War II (as a guarantee of oil supplies for the war effort), and finally our involvement in the Iranian coup that set the Shah up as dictator. The book stops in 1953. There are many details of this history that I didn't know which this book, brief though it is, lays out. I am somewhat troubled by its lack of a bibliography--the authors expect the reader to simply take them at their word that these are true accounts. As I read the section on Iran, it occurred to me that while this history is little known to most Americans, every Iranian probably knows it by heart. So while we may view them simply as religious fanatics, they hold a long grudge. The reason I think so highly of this book is because of the astonishing cartooning of David B. David B employs literary devices that a poet might use: metaphor, metonymy, etc. And he uses devices that don't really have a name because there is no literary equivalent. He employs the structure of comics so creatively that I just can't think of another artist like him. It is especially striking that he uses this vast expressive toolbox in this essentially informational book. It is not an obvious approach, and yet it works beautifully, leaving the reader with a book ten times more fascinating than it would have been with more straightforward comics illustration. David B. turns what would have been just a polemic into a work of art. 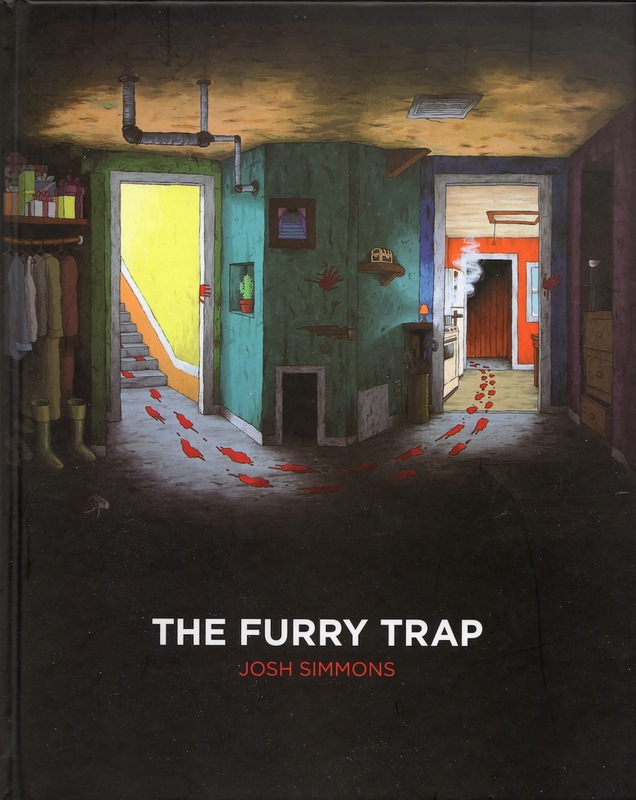 The Furry Trap by Josh Simmons (Fantagraphics Books, 2012). The genre of horror, it seems to me, is at a disadvantage in comics. In prose, horror can use the imagination of the reader to fill in the horrific details--an imagination that each of us has, as we can see from our nightmares. Good prose horror depends on this partnership with the reader to work. In movies, the filmmaker controls time, which means that suspense and dread can be built up to extremely high levels before being released. The simplest version of this (but very effective) is the shot of the long-anticipated bogeyman popping out at the victim/protagonists. Comics can't really do either of these things. So how does a horror cartoonist like Josh Simmons compensate? Partly by an unflinching willingness to show extremely horrible things quite explicitly (in ways that would never fly in a movie intended for general distribution). The Furry Trap is drawn in an accessibly light-hearted style (cartoonish), but Simmons nonetheless depicts terrible things--extreme scenes of sexualized violence. (This is not a book for the kids.) But curiously, the most unsettling story is "Demonwood." It feels like the prelude to the usual Simmons story--the horror is unstoppable and it's coming, but it isn't here yet. And that is truly frightening. 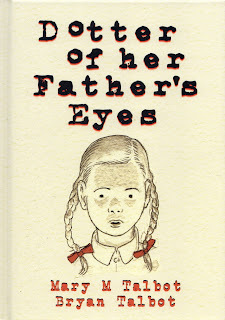 Dotter of Her Father's Eyes by Mary M. Talbot and Bryan Talbot (Dark Horse Comics, 2012). Mary Talbot is an English feminist scholar, the daughter of a well-known Joyce scholar, James S. Atherton, and the wife of graphic novelist Bryan Talbot. 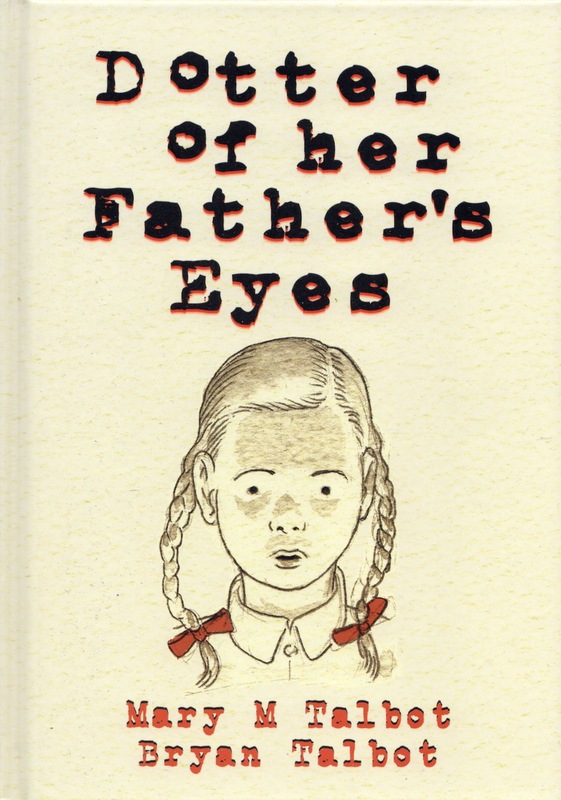 Dotter of Her Father's Eyes parallels her own childhood and upbringing with that of Lucia Joyce, the tragic daughter of James Joyce. And curiously, she chooses to tell it graphic novel form, drawing on her husband's considerable talents and, it must be added, encouraging him to move in a very different direction than his previous work. The book is divided into three interwoven parts--Mary Talbot's past, drawn in brown with a sepia-tone base (with occasional flashes of color), Lucia Joyce's parts, drawn with blue and back duotone, and the scene set in the present, which is drawn with simple black outlines and flat but vibrant Tintin-ish colors. Both of the "past" sections tend towards a sketchiness that I've never seen before in Bryan Talbot's work (it is still very precise; it only feels sketchy compared to his other work). The problem with the book is that the two stories--Mary's and Lucia's--fail to really parallel one another. Lucia's life is one of thwarted ambition and madness. Mary's is one of abuse and neglect by her father. But Mary's ambitions, it seems to me, were never thwarted at all. If anything, her father seems annoyed that she is aiming so low, and is pleased when she gets her PhD. The most interesting parts dealt with the fact that she grew up in a working class neighborhood because her father wasn't making a lot of money as a Joyce scholar. So she had an intellectual cultural upbringing that was of little use to her on the playground. (Girls make fun of her at school for not knowing who the Beatles are.) 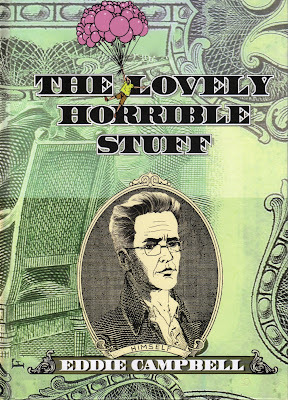 There are parts of this book that are interesting and amusing, but the whole is less than the sum of the parts. 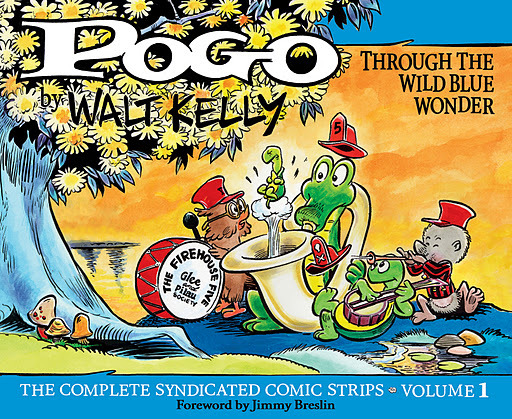 Pogo: The Complete Daily & Sunday Comic Strips, Vol. 1 by Walt Kelly (Fantagraphics, 2011). 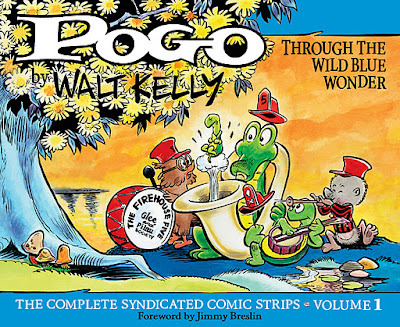 Pogo got its start as a comic book--this origin is possibly unique in the history of comic strips. That was in 1942. Pogo was revived as a daily strip for the New York Star, a short-lived liberal newspaper, and when it folded in 1949, Pogo got picked up by a syndicate and began its glorious newspaper run. This volume reprints all the New York Star strips and all the syndicated strips through the end of 1950. Kelly's drawing style is quite mature--it's not going to evolve much from here on out. He had worked for Disney and had very slick, deft brushwork. But the strip, constrained by space that an animated movie never has to face, is visually dense, a thicket of brushed lines. His language is dense as well--in an era that is about to see the coming of such minimal strips as Peanuts, Beetle Bailey, Hi & Lois, King Aroo, etc., Pogo stands out. These are not strips that, as Wally Wood said of Nancy, take more time not to read than to decide not to read. In the first two years we get some of the familiar tropes and most of the regular characters. There is a world series game, a gift from Porkypine to Pogo on Christmas, and so on. There are hints of the political aspect of the strip that will come to characterize it, but most of that is in the future. For these first two years, it's mostly about slapstick and wordplay. Cartoon Monarch: Otto Soglow and the Little King by Otto Soglow, edited by Dean Mullaney (IDW, 2012). 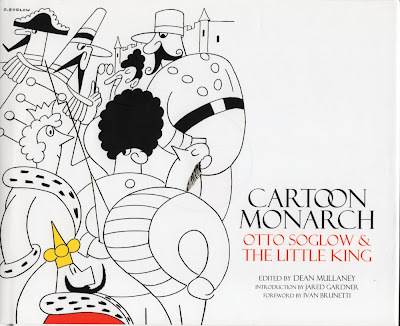 The Little King got its start in The New Yorker and made a transition to the comic strips, where it ran from the 1930s to the 1970s. Soglow was a minimalist--frequently the strips had no words at all, and even when they did, he kept them to a minimum. The drawing consisted of simple forms and elegant, thin lines. The strips dealt with a small number of themes over and over, using them as a way to create formal variations on simple ideas. It's in these variations that the strip shines. This thick, well-edited volume shows Soglow returning to the same jokes over and over again (mixed up hats and crowns, soldiers on parade, advertising signs, etc.). Some of the funniest strips are about the King's reaction to modern art. Cartoonists loved to make fun of modernist art (which I've always found ironic--the greatest cartoonists distorted and abstracted the human figure every bit as much as any modernist painter). But Soglow ends up portraying his king as a post-modernist avant la lettre. There are more than one strip where on seeing an art exhibition, the little king adds his own art--which will invariably be an advertisement or a sign with words. There are several series of comic strip reprints that are attempting to collect the entire work of a given cartoonist on a certain comic strip--Pogo (above), Milton Caniff's Terry and the Pirates, E.C. Segar's Popeye, Frank King's Gasoline Alley, etc. But this approach is not appropriate for every classic comic strip. In the case of The Little King, it would be tedious to read 40 years worth of these strips. This well-chosen collection of Soglow's best is a better way to honor this master of minimalism. Cartoon Monarch also includes an excellent biographical essay on Soglow.